The launch of a new rapid bus line has caused ridership to go down. Capital Metro says they're looking to fix that. 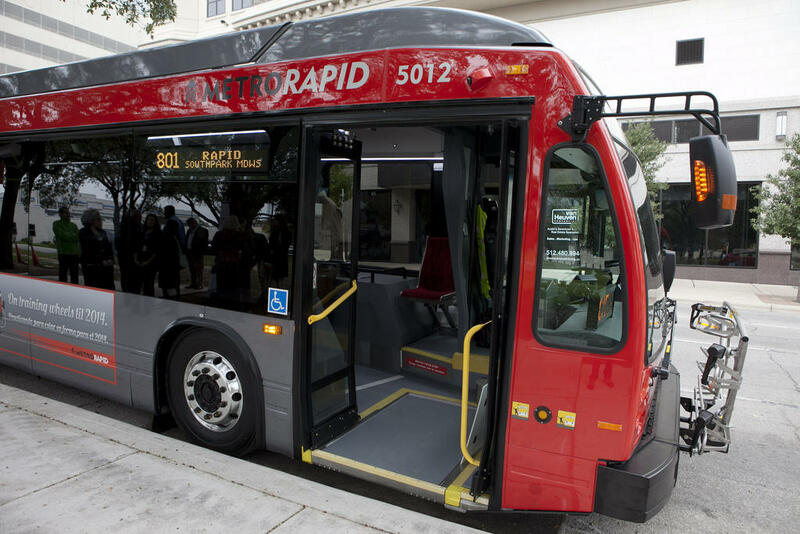 Austin's "MetroRapid" buses are larger and, let's be honest, nicer than your typical bus. They've got more doors, for one, which makes for faster loading and unloading. You can look up when the next one's going to arrive on your smartphone. They have Wi-Fi, too. In January, the first line debuted, the 801, running up and down North Lamar and Congress. This week, the second one started up, the 803, going from the Domain down Burnet, through downtown and down South Lamar. The Rapid bus system is the first major transit project in Austin since the troubled rollout of the MetroRail red line several years ago. * That project was late, over budget and struggled to attract riders. "We certainly didn't want that to happen. We hoped that wouldn’t happen. But it did happen," says Todd Hemingson, Vice President of strategic planning and development with Capital Metro. So why, after premiering shiny new buses with plenty of features, did ridership go down in the corridor? For one, rides on the new rapid buses cost 50 percent more. "I think Capital Metro would agree that charging an extra fare for, you know, what's essentially just basically a bus service? You know, it's a little bit better for people, but I don't know that it's enough that if it's $1.50 instead of a dollar to ride that, I don't know that it's suddenly going to get a huge jump in ridership," says Lyndon Henry, a transportation planning consultant in Austin. According to Jace Deloney, another local transit advocate and board member Austin’s Urban Transportation Commission, originally planners didn't want to have that price difference. "We saw that it had a huge effect, and an unforeseen effect, on ridership," Deloney says. While nearly 80 percent of the capital costs for the rapid buses being covered by the federal government, Capital Metro says the decision to charge more is justified by the higher level of service rapid bus provides. "You have faster travel time, roomier, more comfortable, buses. You have improved stops, Wi-Fi on board. So there's a lot of benefits," says Hemingson with Capital Metro. On top of higher fares with the introduction of rapid buses, existing local bus lines had their frequency cut in half – on the lines with highest ridership in the city, the 1L and the 1M. These were combined into one route, now called the 1. The 801 rapid bus was supposed to siphon off more of those riders than it has. 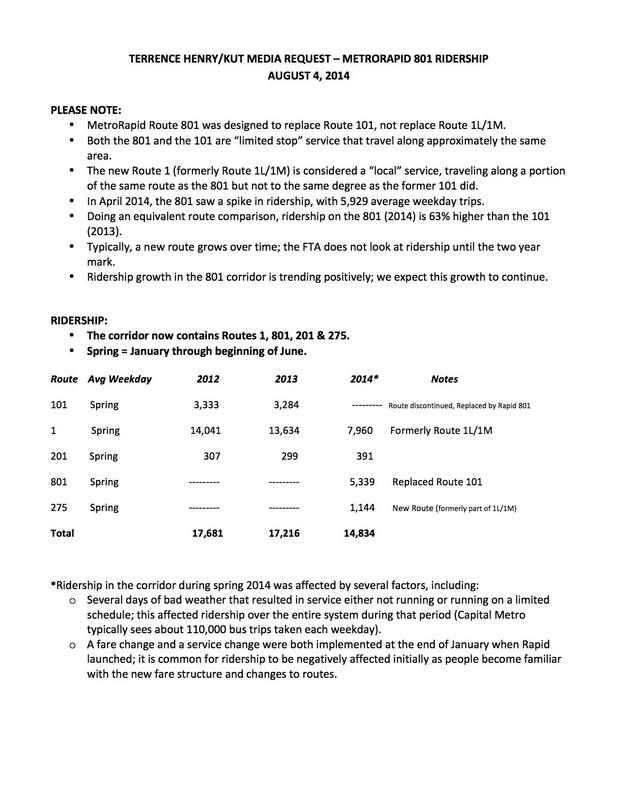 Capital Metro's stated goal of a ten percent increase in ridership in the corridor within two years will now need to be even higher to make up the difference in lost riders: to meet their goals, ridership will need to go up twenty-five percent in the corridor by January 2016. Another aspect of the rapid bus service that impacted regular riders is that the rapid stops are placed further apart, separate from the local bus lines. Transit advocates predicted these factors would cause ridership to go down, and they were proven right. "We're certainly doing the analysis to figure out as much as we can why ridership has dropped some. And we'll come up with a plan to address the situation, and that's what we intend to do here," Hemingson says. Capital Metro says the rapid bus system is starting to go in a positive direction. Any day now, they'll hit the mark of a million trips on Austin's rapid bus lines. In July, the 801 averaged 5,649 trips per weekday, an improvement from the previous few months. With the new line debuting and school starting this week, the agency expects ridership to improve. They're also considering some tweaks to the service, if they can get the city on board, like turning lights green early along parts of the route for rapid buses, called a "queue jumper." "That would give buses a little head start at intersections that are heavily-congested," Hemingson says. A big step would be expanding the bus-only lanes that currently occupy one lane of Guadalupe and Lavaca through downtown. Hemingson of Capital Metro says they'd like to look at expanding those bus-only lanes even further. "In the future, we'll continue to work with the City to try and get more transit priority, which could be more lanes such as what we see on Guadalupe and Lavaca," he says. Expanding those transit lanes – and making them truly dedicated for buses – is high on the wish list of local transit advocates like Deloney. He says while the transit priority lanes are good downtown, they're surrounded by chokepoints that could also use bus-only lanes. He'd like to see bus-only lanes "on the bridges, or through the Drag, or through any high-congested area that has lots of automobile traffic that's actually holding the transit vehicles back, and making them late," Deloney says. And that's an aim of Capital Metro: make mass transit attractive and efficient by making it immune to the woes of traffic. "Local stop service just continues to get bogged down in traffic as congestion grows," Hemingson says. "What we're trying to do to the degree we can is get out ahead of the curve. The goal is to be as congestion-proof as possible." There are some tweaks for the rapid bus lines that folks like Deloney and Henry are advocating that Capital Metro isn't likely to consider anytime soon, however. Deloney wants more stops for the bus, but Capital Metro says this would slow the lines down. Henry wants a set schedule for the routes, instead of the current set-up of every 12-20 minutes on weekdays, which can cause rapid buses to "bunch up" when one of them gets slowed down by traffic. Capital Metro says they're sticking to the frequency model instead of a set schedule in order to keep the buses moving faster, and are looking into the bus-bunching issue. Another tweak would be to make rapid bus fares the same as traditional bus fares, either by lowering fares on the rapid lines or raising fares on traditional ones. The fare difference concerns Deloney, who worries Capital Metro is creating a two-tier transit system that will price out and disadvantage low-income riders. But that's unlikely -- the fare difference between the local service and "premium" lines like MetroRapid will stay for now, Hemingson says. Transportation advocates say Austin should opt for more rapid bus lines to Mueller instead of proposing light rail line stops in the development. In fact, in January, Capital Metro will be raising fares for both local and rapid buses. Local fares will go up 25 percent, to $1.25 for a single ride. Rapid and other "premium" fares will go up to $1.75 for a single ride. Capital Metro says that's still lower on average than "all of its peers" in other cities. Another tweak Deloney recommends is largely out of Capital Metro's hands: better walkability along the Burnet-South Lamar and North Lamar-Congress corridors that the rapid buses serve. "Burnet Road, in a lot of areas, doesn't even have sidewalks," Deloney says. "But I think this gives the City an opportunity to come and fill those gaps in." Capital Metro doesn't have plans for any additional rapid bus lines at the moment, but they are studying some possible additional routes. One candidate they've already spent a little time looking at? A route from East Riverside to the Mueller development. Sound familiar? It's not too different from the light rail proposal Austin voters are set to decide on this fall. Transit advocates like Deloney say they'd prefer true rapid bus service there instead, at a fraction of the cost. *Correction: This article originally said MetroRail launched two years ago; it launched in 2010. 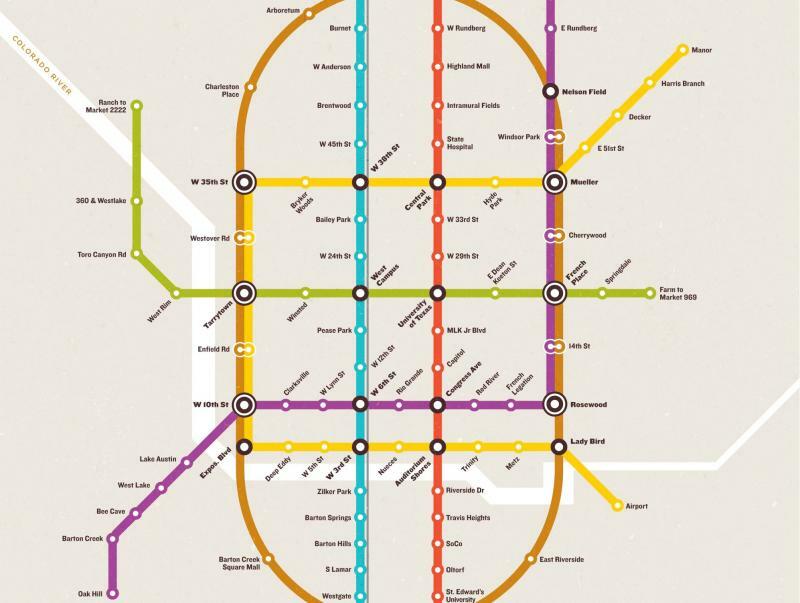 Why Can't Austin Have This Elaborate Subway System? Update (June 17, 2014): This story from 2011 is enjoying a second-life on the Austin Reddit page. After being posted there it inspired a discussion with over 160 comments. For more on a potential Austin subway, see this report from StateImpact Texas: Why Texas Doesn't Have Subways. Original story: A piece of wall art making the rounds online depicts a subway system for Austin that would put this city’s public transit system on par with densely populated cities in the Northeast. The creation is produced and sold by Transit Authority Figures, based in Northampton, Massachusetts. The poster had many people wondering aloud why Austin couldn’t just go ahead and build a world class subway system. We called up Capital Metro’s vice president of strategic planning and development Todd Hemingson and asked him ourselves. KUT News: Why can’t we have an amazing subway system like this in Austin? Standing on Guadalupe Street in Austin facing the tower at the University of Texas, 26-year-old Emily Mandell waits at the bus stop with a scowl on her face. She’s not looking forward to this ride. “It’s the same as sitting in traffic, but now you’re sitting in traffic stopping at a lot of places with a lot of other people,” Mandell says. 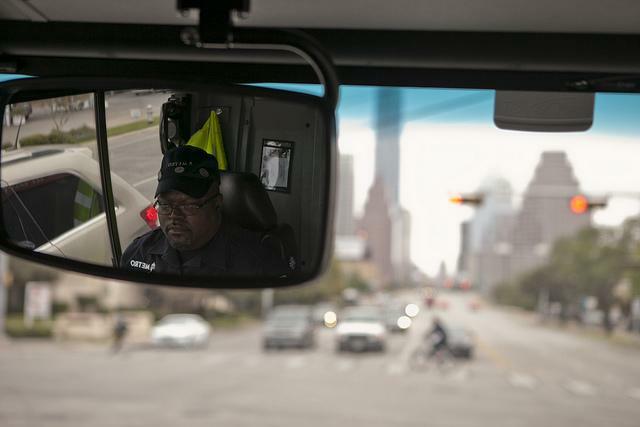 Along Guadalupe and Lavaca, two major north-south arteries through downtown Austin, long, bendy buses labeled “MetroRapid” have recently joined the chaos that is Austin traffic. The city of Austin’s transportation agency, Capital Metro, rolled out this new line in January* in an effort to get more people out of cars and using public transportation. But the rollout hasn't gone as expected, calling into question how the agency will handle expanding transportation to meet the fast-growing city's needs. The Austin City Council is considering an ordinance that would set rules for the city’s new transit lanes. Bus-only lanes for Capital Metro’s new MetroRapid service are on Guadalupe and Lavaca streets between Martin Luther King Boulevard and Cesar Chavez Street. Other vehicles are only allowed to use the lanes to make right turns. The new ordinance would make it against the law to stop or park in the lanes. Currently that could be punished with a $25 dollar parking ticket – but the city wants to up that fine to as much as $500 dollars.